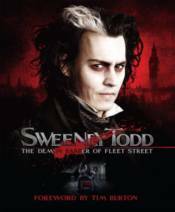 Johnny Depp and Tim Burton join forces again in a big-screen adaptation of Stephen Sondheim's award-winning musical thriller "Sweeney Todd".Depp stars as the Demon Barber of Fleet Street, joined by Helena Bonham Carter as Mrs. Lovett, Sweeney's amorous accomplice, who creates diabolical meat pies...The cast also includes Alan Rickman, Timothy Spall and Sacha Baron Cohen.Produced in close co-operation with Tim Burton and the production team, this lavish, full colour hardcover official companion volume to the film will include a Foreword by Tim Burton, over 200 photos, concept drawings and production designs, extracts from the screenplay and interviews with the cast and crew. I LOVE THE ILLUSION: THE LIFE AND CAREER OF AGNES MOOREHEAD, 2ND EDITION I WANT IT NOW! WESTERN MOVIE QUIZ BOOK (SOFTCOVER EDITION) BY GRAEME ROSS WHAT'S IT ALL ABOUT, SYBIL?